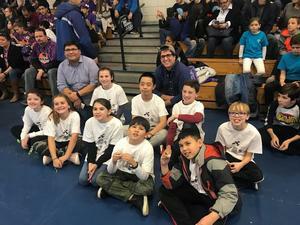 On Saturday November 17, All Saints Seniors First Lego League team had their second qualifying tournament at St. Mary’s School in Ridgefield. The team showed great professionalism, sharing souvenirs and notes with other teams and working together at their pit table and the practice table. When we arrived in the morning, the team helped to organizers setting us the practice table showing a collaborative spirit to everybody at the event. At their first robot mission game, the team scored 82 point which gave them the lead for two games, then they stayed in third place until the end of the games being on top of the five teams with higher scores. At each of their judging presentations, they showed impressive team collaboration, explaining about their project, their decisions, core values and how the team worked together prior and during the event. Some judges were impressed with the team, and some organizers told the team they were very cute and funny. Some of the team members have friends who were participating with other teams and they showed respect and friendship at every moment. Being the school's second tournament participation, they did a great job and got into a nice position, showing how they keep learning and improving. Congratulations to All Saints Catholic School team! Click here to see photos from the day!